The Drinkerella (Regina ebrius) is a humanoid monster that wanders the outskirts of the castle they live in, having snuck past the castle guards after a night of heavy drinking. 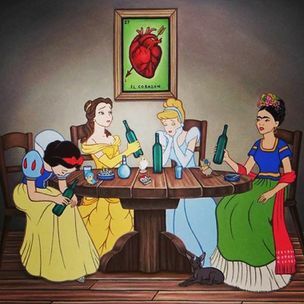 There are several ways a Drinkerella can be brought into existence, but the most common origin is as follows: a young woman hastily marries into nobility, and after some time passes, the woman becomes bored and unhappy with her new husband and life as royalty, and is inflicted with a condition known as "alcoholism". Over time, her alcoholism will fester and grow to the point she can't control herself and her actions, and will regularly become heavily intoxicated, which causes her to leave the castle to seek out strangers with belligerent intent. Aside from a few key differences (as listed below), a Drinkerella's fighting technique is not all that different from the average drunken brawler's, and therefore your heroine should not have too much trouble putting one down, considering her likely experience with such fights. ↑ The exact amount of time varies by individual specimen, but is typically within a few months of marriage. ↑ Alcoholism is clinically defined as "an addiction to the consumption of alcoholic liquor or the mental illness and compulsive behavior resulting from alcohol dependency." This page was last edited on 6 January 2019, at 17:12.